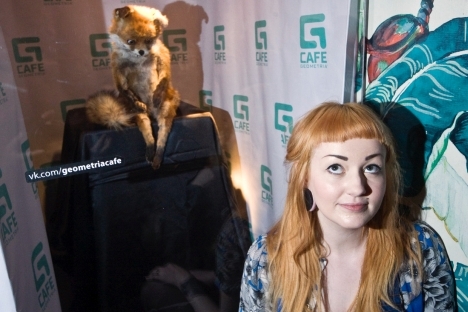 An exhibition dedicated to “Stoned Fox” – a botched attempt at a stuffed animal by British taxidermist and artist Adele Morse – finally opened in St. Petersburg, despite opposition from a number of politicians. The fox and related memes and digital collages are on display at the Geometria Café. Pictures of the fox have become quite popular on the Internet, going viral in Russia. The images have been photo-shopped onto pictures of politicians, pop stars, TV presenters, revolutionaries, soccer players and even murderers. In March of this year it was announced that Morse had been invited to come to Russia. Predictably, the invitation caused an outrage among St. Petersburg’s freaks. Orthodox fundamentalist Vitaly Milonov, a member of the city council and sponsor of a law outlawing gay propaganda, accused Morse of animal cruelty (apparently the accusation is applicable only to dead animals). He also said that Morse had been linked to dog hunting and called on all dog owners in the city to come to the opening of the exhibition. No one showed up though. Morse, whose first time it is in Russia, told a press conference that she had never tortured any animals. “I only heard about Milonov when he talked about me, calling me mentally unstable and inviting his supporters to bring their dogs to the exhibition. I beg to differ. Everyone is entitled to their own attitudes, opinions and views, but he has a totally wrong idea of me. I’m the last person in the world you can accuse of animal cruelty. I have been a vegetarian for over 10 years,” she was quoted by Fontanka.ru as saying. Even so, members of the Communists of Leningrad Region also eventually joined the campaign against “Stoned Fox.” This group of left-wing, media-seeking freaks, which capitalize on the similarity of their party’s name to the influential parliamentary Communist Party of the Russian Federation, like to get publicity with crazy pronouncements on cultural matters. They have asked the Orthodox Church to canonizethe dictator Joseph Stalin, demanded an apology from former President Nicolas Sarkozy of France for the death of Russian genius Alexander Pushkin at the hands Frenchman d’Anthèsin a duel in 1837, and criticized James Cameron’s film “Avatar,” among other things. Of course, they could not let the media opportunity presented by “Stoned Fox” slip away, especially after the fox had its picture taken with none other than Vladimir Lenin. This was enough to tick off St. Petersburg’s Communists. “Evil has befallen our city – because of the indecisiveness and cowardice of city authorities, the taxidermist, sadist and drug addict A. Morse, who allowed herself to mock a great people and its history, was let into the hero city. The Englishwoman has cynically stated that her artificially created animal ‘looks a bit sad and drunk and that’s how Russians feel. His plastic eyes give him a glazed look and they identify with it, they think it symbolizes the nation.’Such a public offense [...] didn’t get an appropriate response from law enforcement agencies or border control services. The law enforcement agencies in this case failed to fulfill their duty to the Homeland!” read a statement on the party’s website. And it didn’t stop there. The Communists even tried to set the Federal Service for Supervision of Consumer Rights Protection and Human Well-Being – an agency in charge of sanitary inspections – on the Geometria Café where the exhibition is taking place until April 7. Their complaint said that the stuffed fox could carry a disease. Like the city’s dog owners, the inspectors never showed up either. In any case, the artist never called “Stoned Fox” a symbol of Russia. “There is one quote in an interview that has got everyone up in arms. ‘The fox looks a bit sad and drunk and that’s how Russians feel. His plastic eyes give him a glazed look and they identify with it, they think it symbolizes the nation.’ This is a complete misquote. I just quoted a fan. I really don’t know why the fox is so popular in Russia,” Adele Morse told a press conference that was attended by more than a hundred journalists – almost three times the number that usually comes to city government meetings.